I'm soooooo happy! 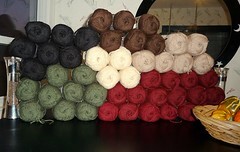 I've been picking up some of the Berella 4 yarn to use on my bears and it's been on sale for $1.49. So I stop in a Michael's that I'd never been in before and low and behold they had the Berella 4 yarn on sale for 99 cents! Holy cow, I bought all the colors they had that I thought I could make work for a bedroom afghan for in the summer when we don't have the big duvet on there. It's a king size bed and I figure the finished size needs to be about 84" x 90". That's a lot of yarn! Well, the rather unfriendly cashier (not that it matters, I just feel I need to add that) didn't give me the bag that had the bag of fake gourds in it so I had to go back out to that store to get it. I hate that! So on the way out to 'out of my way', I figured I stop at "my" Michael's and see if the 1.49 price had gone down.... IT HAD! Totally cool, because I'd bought green from the far away Michael's and I didn't really want to use it, but at that cost who could resist! Anyway, after doing some figuring I was thinking I might still need a few more skeins of a few of the colors to make this afghan so I went to yet another Michael's. They did not have the yarn at 99 cent price, but I bought enough of what I thought I might need at the 1.49 price... I can always return the unused skeins. I'm so loving this! This feeling is totally cancelling out the fact that I'm about to frog the DNA scarf becuase I didn't do the mini cables correctly... oops.